When I heard Neil Gaiman speak last year in Nashville, he told us that he hand writes all his manuscripts. Further, he uses a different pen, with a different color of ink every day so that he can track his progress. (There is a small column by Neil about his pen usage partway down this article on the BBC News.) I find that idea very intriguing, although, I like the instant gratification of typing directly into a GoogleDoc that I can share with my collaborator or my beta reader. I hand write my journal and I hand write letters. So many letters. 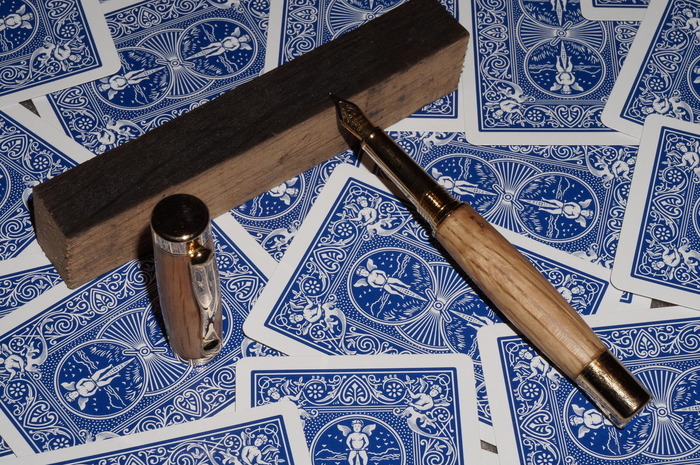 So, I thought I would talk briefly about the three fountain pens I do use. Two of them are incredibly cheap, but perfectly serviceable pens. 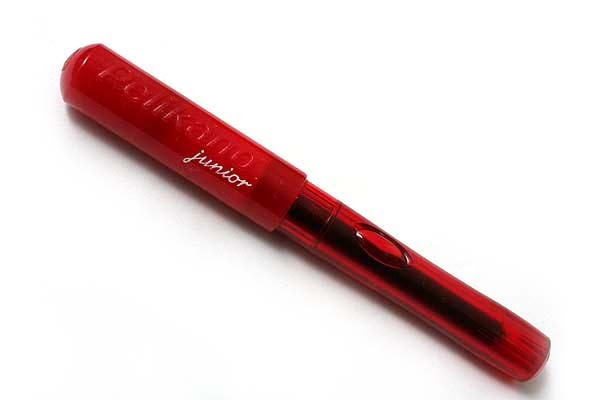 This is about a $15 pen, depending on where you get it. It’s actually designed for children. It has a large, plastic barrel and a shaped finger grip so that you can’t hold it wrong. It has a medium-ish size nib, which actually feels very fat to me now that I’ve been using a fine nib for a while. I lost my first Pelikano Jr. and replaced it immediately. For $15 it’s very sturdy. I’ve had my current Jr. for over a year now. Someone on twitter made fun of me a little for using a children’s pen, but I don’t really care. It works and it’s comfortable. This pen was actually started as a Kickstarter project, although I got mine at the Magic City Art Connection earlier this year. The pen barrels are turned out of decommissioned whiskey barrels, either Jack Daniels or Maker’s Mark. I think mine was Maker’s Mark, but I lost the card that told me for sure. This is the pen I used the most often. It feels good in my hand and has a fine nib, which I prefer. If I could write any thinner I would. 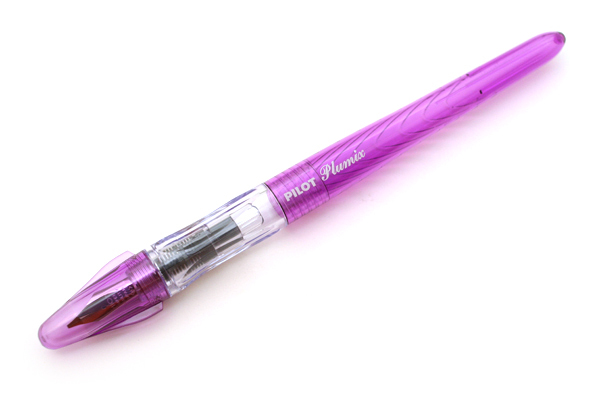 The only downside is that the pen is quite heavy if you post the cap (putting it on the back of the pen while you write.) So, I tend to leave the cap off, which means I sometimes knock it off my writing surface. Not a tragedy. This is a cheap pen. It looks cheap and it feels cheap. But, it has an italic nib and it writes smoothly. I wasn’t quite ready to invest in a very fancy pen. The Whiskey Barrel Pen is my most expensive writing implement to date and it was under $100, which isn’t bad for a fountain pen. The Plumix is $7.25. That’s a price at which I don’t feel bad conducting an experiment. I just got the pen yesterday, so I haven’t had much time to try it out, but I did write a letter immediately and it had a very nice flow. It’s thin, which is a it odd after using the wooden pen for so long, which is almost as thick as a fat marker. It’s also very light. It’s a bit hard to remember I’m actually using a fountain pen. In case you’re interested in that sort of thing, I use cartridges in all my pens. I’ve found that I absolutely cannot fill a converter without making a giant mess. Maybe someday. I will use a syringe to refill an empty cartridge with bottled ink so that I can get some more variety in colors. So far, I’ve only used Noodler’s Ink and found it quite nice. I prefer a waterproof ink, especially since I send so much mail. I don’t want to risk the address being obliterated before the letter can arrive at its destination. Sadly, most of the inks I’ve found in cartridges aren’t waterproof, but that’s where the syringe method comes in handy. If you happen to be in the Chicago area, the Letter Writer’s Alliance often has workshops at GREER. They just had one on fountain pens. It looked like a ton of fun!